WHY BUY A WHEELIE BIN COVER? Are you sick of your wheelie bin creating an unsightly mess in your garden? 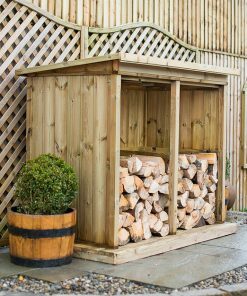 Then it’s time to invest in a high-quality wooden wheelie bin cover from Wheelie Bin Storage Direct. 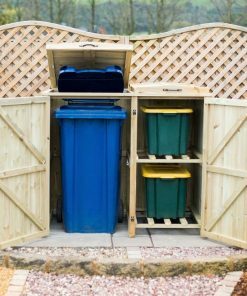 Not just aesthetically pleasing, our wheelie bin storage products offer easy access to your bins while at the same time keeping them secure and out of sight. 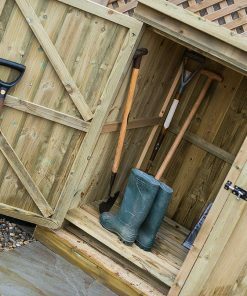 Alongside wheelie bin stores, we also have solutions to store away recycle boxes, plus a range of small tool sheds and log stores. 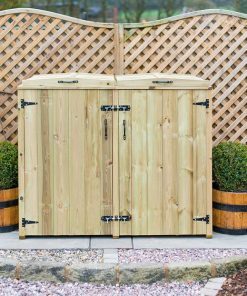 By choosing one of our superior wheelie bin or garden storage units, you’ll be the envy of your neighbours and your garden will look much tidier for it. Boost the kerb appeal of your property today with a top quality wheelie bin storage chest. 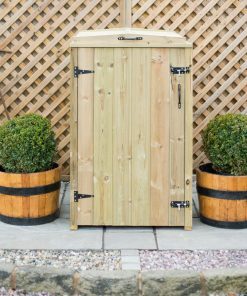 We stock a range of pressure treated wheelie bin storage units that are built to last and make a stylish addition to any garden, pathway or the front of any townhouse. 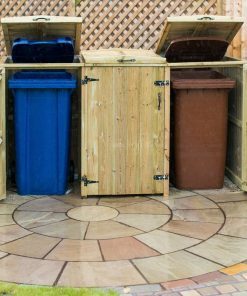 Our bin stores are available in multiple sizes to cater for a range of households. 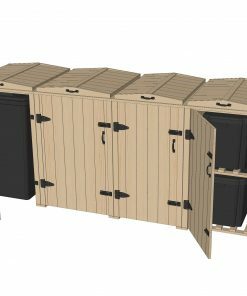 We stock single, double, triple, quad and even quintet wheelie bin storage units! 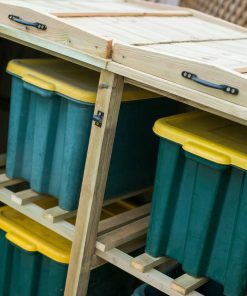 All bin stores are delivered in flat pack form and are easy to put together thanks to comprehensive yet easy to follow instructions and video guides. 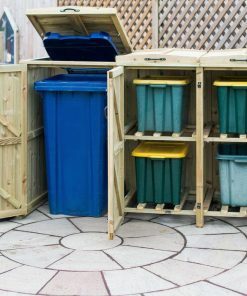 Why Shop With Wheelie Bin Storage Direct? The Wheelie Bin Storage Direct website is secured by a Trustwave SSL certificate. Ensuring any data transferred through our site is encrypted. We offer free UK delivery to the vast majority of UK mainland postcodes. Some areas of Scotland and the highlands are excluded; any charges are shown prior to checkout. Our customer service team are on hand to answer any queries you might have about our wheelie bin covers. Use our contact form or live chat during normal working hours to speak with us. Wheelie bins indeed serve a purpose, but they're big, bulky and can often look tatty when they've been dragged around by the local council on bin emptying day. Whether you think they're an eyesore or just about find them tolerable, they're not exactly the sort of thing you want as the focal point of your garden. A well-made wheelie bin store solves the problem by putting them out of sight and out of mind. 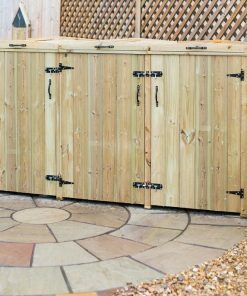 Our wheelie bin storage chests are of course for storing away bins, but when designing the product, we also spent a lot of time on the appearance. 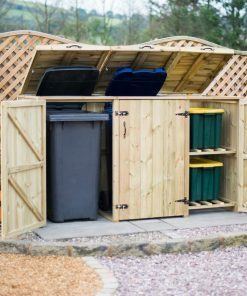 Ideally, the bin store you choose will complement the style of your property. 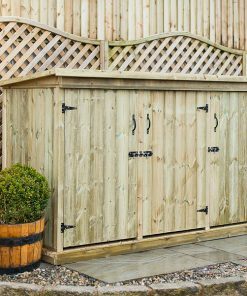 For example, if you have a stylish period property do you really want a plastic wheelie bin store that basically looks like a bigger wheelie bin with doors? Probably not. That's why we produced a store that works in a wide range of settings, be it a Victorian terrace or a new build townhouse our Bellus range of bin stores is equally at home. 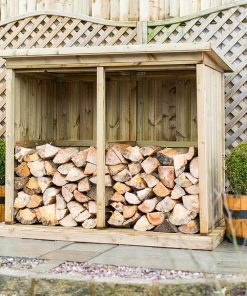 The beauty of using timber also means they can be painted to suit pre-existing garden furniture or to blend into other elements of your garden. For customer concerned about longevity, we've got bin stores that have been out in the wild now for over 5 years and are still going strong. 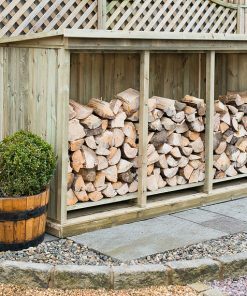 We use pressure treated timber for all of our bin stores to ensure the store is impervious to rot. 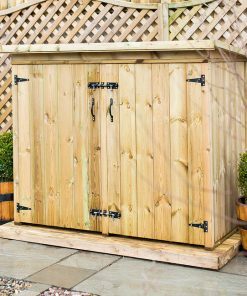 This is timber that's undergone treatment under pressure with a chemical called tanalith e. Of course, this doesn't mean the store is maintenance free, it will need regular coats of wood stain or preservative and we've written a guide on maximising the life of your wheelie bin storage to help. All our timber is also sourced from FSC (Forest Stewardship Council) certified forests. This means that wildlife habitats were protected, the surrounding communities have a say and that the highest environmental standards are adhered to. 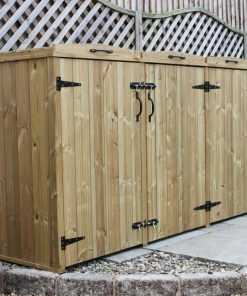 Our wheelie bin stores also give you some protection against the growing problem of fly tipping. With many councils reducing the number of bin collections, homeowners in some areas are often finding their bins filled with someone else's rubbish. Our bin stores deter this sort of behaviour as they're supplied with a floor fixing kit, and they're also lockable preventing unauthorised access. Really pleased with my new wheelie bin storage unit, prompt delivery and it was very easy to put together. Good instructions and it’s very well made. I’ve stained it to match my fencing and couldn’t be happier with my purchase. Great product and this covers both my wheelie bins plus recycling boxes easily and I really like the ease of access for putting the rubbish out in the middle of the night. Didn’t take me long to put it together at all either! This is a very well made wheelie bin cover and I am very happy. I had a cheap untreated one which only lasted a year so very happy with my investment in a pressure treated store, it also blends in really well with the rest of the garden.